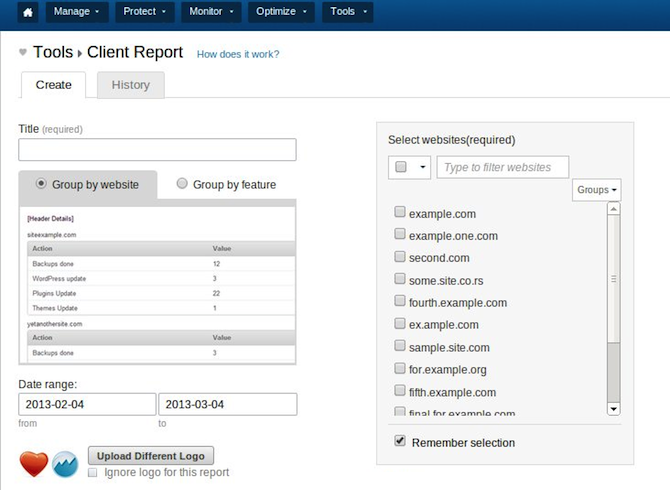 The announcement of the new dashboard was accompanied by mention of a brand new client reporting feature. In a nutshell, it helps you create professional and fully editable reports that can be exported to PDF, shared via email or sent via secret links. We knew that this was a feature that a lot of our users wanted so developing it was a major priority. The dust may now have cleared from the launch of the new dashboard but we have been working hard in the meantime to improve our reporting tool so that it is as intuitive and feature-packed as possible. In this post I want to introduce you to the tool and show you how it can help you to keep your clients abreast of your actions. This is the area from which you can customize and generate just about any imaginable report relating to the maintenance of your clients’ sites. As you can see you are able to change the action labels and the actual values as you see fit. As you can see from the above screenshot, it is possible to include your logo for branding purposes and append manual text to inform the client of anything specific. No matter the reason you never have to worry about past data being lost — not only the raw data stored as a matter of course, every single past report is made available under this tab. 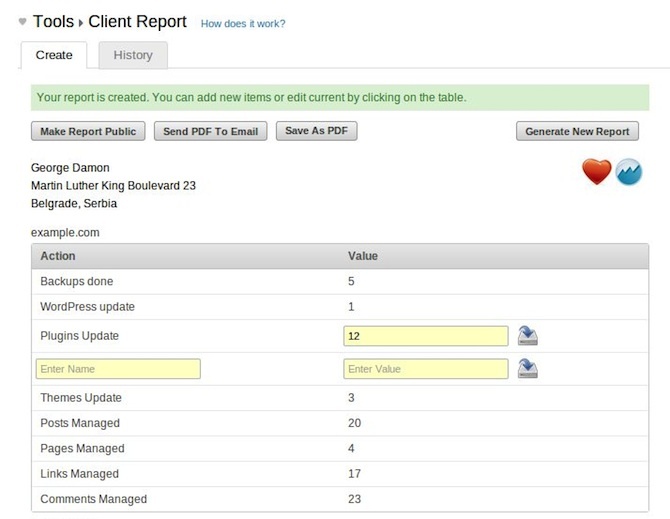 The Client Reports feature represents an evolution of design. We started off with an idea (thanks to your suggestions!) and have developed it into its current form from scratch. With that in mind, we’d love to get your feedback. Our aim is to constantly and consistently improve the ManageWP service, so if you have any comments regarding the Client Reports feature then please fire away in the comments section below! 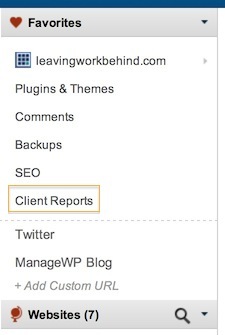 Automated reports would be the feature that will make me move my 30+ sites to ManageWP. Do you guys have a public roadmap of features? Please add the name of the Plugins and Themes updated, otherwise, the report is somewhat useless. Please include a list telling us what plugins and themes were updated and when, instead of just a count. This becomes very useful when tracking down rogue installs that are causing site errors. Yes please, +1 to this. Extremely important. Thanks! Was this feature ever considered? Yep, it will soon be included in the ManageWP Orion Client Report. I can’t believe no one else has asked for or mentioned the scheduling of reports automatically. So every week, the same report is generated automatically for me and even emailed to someone automatically every week if I choose that option. Google Analytics does this. Any update here? This seems like such an obvious feature I was shocked to see it wasn’t included out of the gate. Looks great! 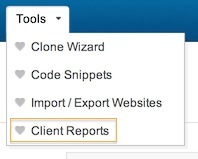 Is there a way to generate and send reports to the clients in bulk, or is it necessary to send them individually? hi, my other 3 websites all appear in your statistics graph, but when i goose greenspandental, from the drop down, it has no data, why is that?? I’ve also had this problem: ie all zeros. Is there an answer to this one please? Submitted my feedback last week.. Fingers crossed the info helped! Love the new feature, ManageWP team. 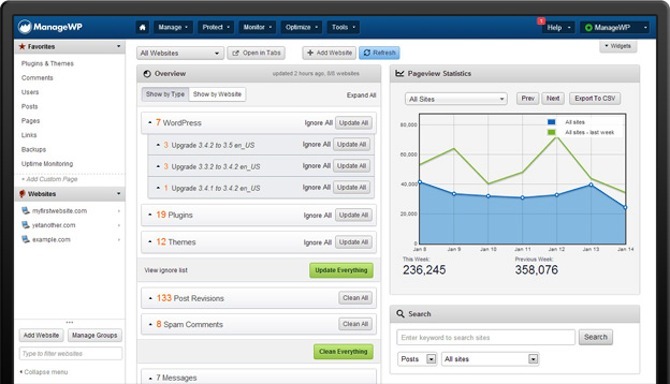 They are building an all-in-one SEO Report builder. I would appreciate more information on the backups being available to the client (Specifically the date that the backups were taken and the size of the backups). Please feel free to email vladimir@managewp.com with what exactly you’d like included and in what format. Your feedback is much appreciated and helps us with the development. These reports are a great addition to an already great dashboard. I hope to be able to utilise these more when I take on more clients. Tom, are there any plans to incorporate SEO information in these reports in the future? That’s something that I, as an agency owner, would use extensively, and I suspect many others would as well. Of course, you should do your due diligence to ensure that’s a feature that would be useful to your customers. I second the SEO features. If you can get even close to what Raventools provide then I imagine a lot of new business coming your way. I look forward to watching this space. I would third including the SEO dat ain the reports, a t the moment i will do that manually. I’d love to see this too. 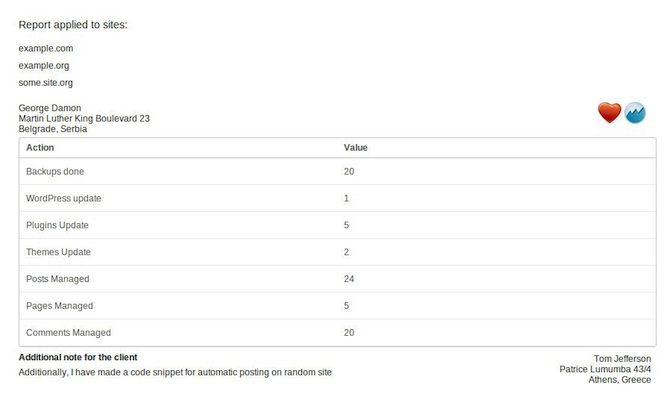 Some basic analytics and kw tracking would be awesome! Another person who’d love to see the ability to add SEO details about the domain to the reports. That along with the ability to schedule reports each week/month!